2 flute, carbide tipped. 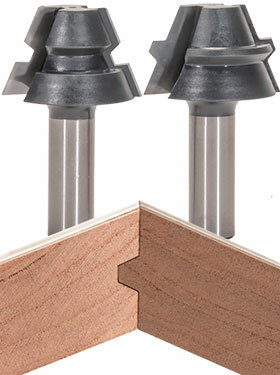 To join materials at 90° by cutting a 45° miter and a perfect matching tongue & groove glue joint. This joint not only increases mechanical strength, but also increases glue surface area and automatically aligns parts. Set-up blocks sold separately below. Set-Up blocks sold separately below. Picked this up today, because I needed to assemble a banister I made out of 4 raised panels, that were 6 1/2x28. I was skeptical about it working on a long surface, but man was I surprised. I got back to the job set the bit up in table and ran two pieces. Perfect the first time, incredibly easy to set up. I ran two of the pieces through on edge in three passes, both sides. Ran the other two through face up in three passes. They slid right together and were perfectly square. These are a must have for me now!!! Love it!! I have just finished using the one that I had purchased and have had terrific results. It is so much easier and effective for making the 90 degree corners on all pieces of wood. It takes some time to work with, but once you become familiar with it, the router bit produces fantastic results. All of the corners are square and very strong. Test cut in 12" long dry oak was absolutely perfect. Found the set up guide blocks useful. Lept to a 7 foot long cut in walnut for box beams for a king size bed. Absolutely loved an earlier review suggesting leaving 1/16th or so in thickness when milling your own stock. I used a drum sander to remove the excess after the miter .. avoided risk of snipe on the planer .. got a knife edge. Had early problem with glue-up. The tongue and groove, when using a single bit and single fence setting, are apparently so tight, there is little to no room for glue squeeze out .. especially in a 7 foot long joint. Resorted to gluing only the 45 degree flat surfaces, leaving the tongue and grooves dry. Much better fit. Got the minimum desired squeeze out at the 90 degree inside and outside edges making for a very tight looking edge. In my project, with the box frame still in three sides, I glued in some ribs to make up for any loss of strength I caused by not gluing the tongues and grooves. I used this bit to make many drawer boxes for a very large desk. It's rock solid after glue up and very square off the router. I found the setup block helpful in that it cut setup time significantly. I too used this bit to make table legs because I did not want to show a glue joint down the piece. I was very happy with the outcome. The setup block was nice but not 100% necessary. Also, if you are milling your own wood to thickness, I recommend that you leave a sixteenth or so on the thickness before routing the lock miter. This way, you are not producing a sharp edge to ride on the out feed fence. Mill to final thickness after the miter has been routed. Best of all, the joint produces a near perfect 90 degree joint with little effort. Just make sure to clamp it tight. If you want to build a table leg made from 4 pieces of wood this is the answer. Used it to make legs for a Craftsman design dining room table. Many of my woodworking pals thought the legs were solid, but I explained how this bit works and a couple added this bit to their collections. Also, this is a great bit for making drawer boxes. The front, sides and back interlock and make a joint of unprecedented strength. Also, the set-up block is a near necessity for accurate joints. There are alternative set-ups but the block is easiest. I have used this product and found it to be very useful, and would recommend it to anyone wanting a secure joint in their woodworking. The video is most helpful. Save time, effort and wood. 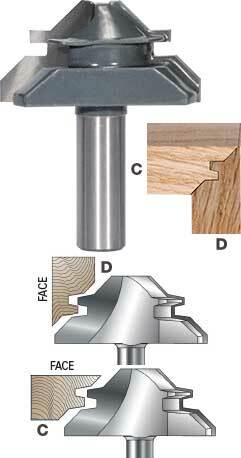 The pre-cut joint profile allows quick, proper height adjustments with accurate setup everytime. The size of the set-up blocks varies: #9753 is 3‑3/4" x 1-1/2", #9750 is 4" x 1‑7/8", #9751 is 3-3/4" x 1‑7/8". They're manufactured from ultra high molecular weight polymer. Items #9750 and #9751 are for 1/2" and 3/4" stock. Item #9753 is for 3/4" stock only. Instructions included. Note: The joint may need to be fine tuned after the first cut to get a perfect fit. Overall I like this bit and the set up block gets you within a few mils accurate. I used it on making 3” thick front floating shelves out of 3/4” MDF. The end result was terrific. This joint requires serious clamping as it is a very close tolerance fit. But the end result is extremely tight miter that finished perfectly. Love the bit and the strength of the joint. However I highly suggest using a backer board to prevent tear out at the rear of your workpiece. 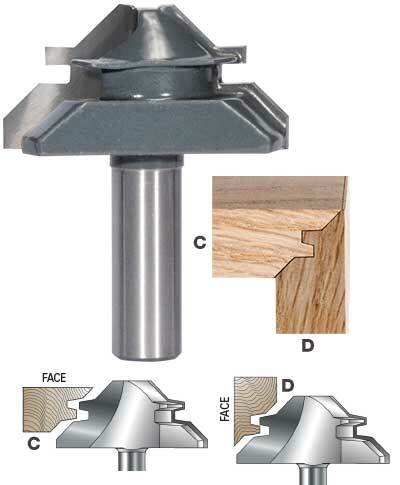 I am sure the lock miter bit and setup block is a good product. However, I did not know about the set up block until AFTER testing the bit and failed. It would be nice to know about the added cost of a setup up block BEFORE ordering the bit. Why is it not listed as a KIT? Thus only 3 stars. MLCS NOTE: The setup block is listed right on the page with the bit. We do not include it as part of the package because many customers do not need the block and this helps to keep the price lower. just got my lock miter bit today. worked perfectly.. ordered the set up block for 1/2-3/4 stock. block setup made it fast and accurate. save yourself time, buy the setup block.. I got my lock miter bit in a few weeks ago. I have use it to create table legs for a dining table I am making. I didn't want lamination joints showing where I built up the thickness so I used 3/4 inch stock and made essentially column for the legs. They turned out great. I ran a few practice boards and it didn't take me long to figure out it is best to leave the thickness about 1/16 inch from the final thickness just to have an edge to run along the out feed fence. 2 flute, carbide tipped 1/2" shank set. The 2 bit system joins material at 45° by cutting a 22‑1/2° miter. Makes a perfect matching, strong tongue and groove joint. Easy set-up. Use for octagonal shapes on corner cabinet, entertainment centers, etc. For 1/2" to 15/16" stock. Set-Up Block sold separately below. There will always be tear out on plywood. BUT if u put a backing board on it to protect the thin plywood edge YOU WILL NOT GET BREAK OUT.. you will get a good looking edge, I have used these to make boxes and have never been disappointed. Tried bits on plywood and hardwood. Works ok on hardwood but on plywood had lots of tear out, even when taking shallow scoring cuts.